All linens such as sheets, pillow cases, winter blankets, comforters or duvet covers (when applicable) are in Breckenridge Condominiums. Flat sheets and pillows and pillow cases are provided for the sofa sleepers as well. Each full bathroom is stocked with 4 bath towels, 2 hand towels and 4 washcloths. Each half bathroom has 2 hand towels and 2 washcloths. Fully equipped kitchen unless otherwise noted. You will have all the basics needed including cookware, utensils, table settings and common appliances like stove, oven, refrigerator/freezer, microwave, toaster and coffee maker (coffee filters not provided). Dish soap, dishwasher detergent and 2 kitchen towels. A welcome supply of hand soap, facial soap, and laundry detergent. Paper products such as toilet paper, facial tissue and paper towels. There will be a minimum of 1 humidifier per bedroom. There will be an iron and ironing board in each unit. Food products, spices, condiments and basic cooking supplies (i.e., salt or pepper, flour or sugar) are not supplied. We recommend that you bring specialty items such as waffle irons, garlic presses and blenders. Toothpaste, toothbrushes, shampoo, ibuprofen/aspirin and any other toiletries are not included. None of our properties have air conditioning. Are you protected? Travel Insurance offers you the peace of mind needed when planning your vacation. Protect your investment by purchasing CSA Insurance for only 6.95% of your reservation total. The old travel industry motto is that if you can’t afford to lose the amount you have invested for your vacation rental, then you should probably opt for the insurance as a safety net. Because we have a 60-day cancellation policy (60-day for Holiday, 14-day for summer) for most of our ski season, last minute cancellations are rare; However, we know that life throws many unexpected situations at you. We are unable to make any exceptions for non-refundable cancellations. Let us know if you would like to purchase travel insurance for your Breckenridge vacation. Breckenridge is located approximately 100 miles from Denver International Airport. Guests who fly in will typically rent a vehicle or rely on one of the airport transfer companies. We recommend booking your car rentals via Expedia or Hotwire. Denver International Airport offers a wonderful variety car rental companies to choose from. Keep in mind there is a hefty airport tax so make sure you look at the bottom like price. Availability during the holidays can get tight so consider booking early and don’t be surprised by premium pricing. It’s about a 1 hr 45 min to 2 hr drive. Flat Rate Transportation is exclusive to our guests. For groups over 3 but less than 7 this represents the best value. Depending on the group and amount of luggage we can accommodate up to 7 people in the SUV. The service includes time to pickup keys at a property manager. This is door to door service with an immediate pickup outside the door. The service is a private ride not a shared ride. Additionally it offers a flat 2 hr 15 min from pickup to get to your destination which might allow you a quick stop to go grocery shopping or a quick stop for food. Summit Express is one of our best values for door-to-door shuttle transfers from Denver International Airport (DIA). Rates range from $52-$64/person, each way from DIA. Travel with 3 or more people at the same time and receive discounted rates. Kids ride for $32. Mercedes Sprinters will be the primary shared ride vehicle. All Mercedes Sprinters will have free Wi-Fi and TV/DVD players on-board. All Vans will have free Wi-Fi! Private SUV’s will have TV/DVD players, but no Wi-Fi. E-mail us to reserve your Summit Express airport shuttle now. Click here to book your Summit Express airport transfers. Colorado Mountain Express is Colorado’s largest airport shuttle service offering hourly departures from DIA with free on-board WiFi service. Round-trip rates starting at $130/person. Click here to reserve your Colorado Mountain Express airport shuttle now. Peak1 Express has a fresh fleet of Mercedes cruisers with convenient departures from DIA. Click here to reserve your Denver airport shuttle now. Breckenridge Ski Resort has released their early booking lift ticket pricing for the 2015 – 2016 ski season. You want to do advance purchase of Lift tickets no later than 2 weeks prior to arrival. The best deal is to decide early and sign up for the Epic passes. Breckenridge Ski Resort’s closing date is scheduled for Sunday, April 17, 2016 and is subject to change. All Breckenridge lift tickets are also valid at Keystone & Arapahoe Basin. Children 4 and under ski free. Free 4 and under tickets cannot be pre-ordered. Denver International Airport (DIA) is approximately 100 miles from Breckenridge. As a key player in the domestic travel scene, there are thousands of flights in and out of DIA every day. In 2011, over 53 million passengers traveled through this modern airport. The airlines which provide the most flights into Denver from our major Breckenridge travel markets include United, Frontier, Southwest, American, Delta, JetBlue and several others. The airport provides the full range of rental car companies, along with several Ground Transportation options to get you up to Breckenridge. The second option is to fly into Eagle Vail. Its about a 50 min drive to Breckenridge. We don’t recommend this option because shuttle transfers are expensive and there is limited availability of car rentals once you arrive. You might save about 1 hour of driving time but you won’t save any travel time because almost all flights to Eagle/Vail transfer in Denver. Please consider this point before booking. We work with a few different ski & snowboard rental shops here in Breckenridge. All of them will honor a discount for our guests if you mention you are staying with Great Western Lodging. Main Street Sports – Caters to our guests and only a 1.5 block walk from the chairlift with great personalized service and best value rental prices. Breeze Ski Rentals – Very close to the lift ticket office in the Village at the Base of Peak 9. Charter Sports – Right next to the Marriott the ultimate in convenience. The shop will allow you to “check” your skis in for the night saving you a 2 min walk with them back to the condo. There are two primary overnight lots in Breckenridge. There are parking meters with CC readers. 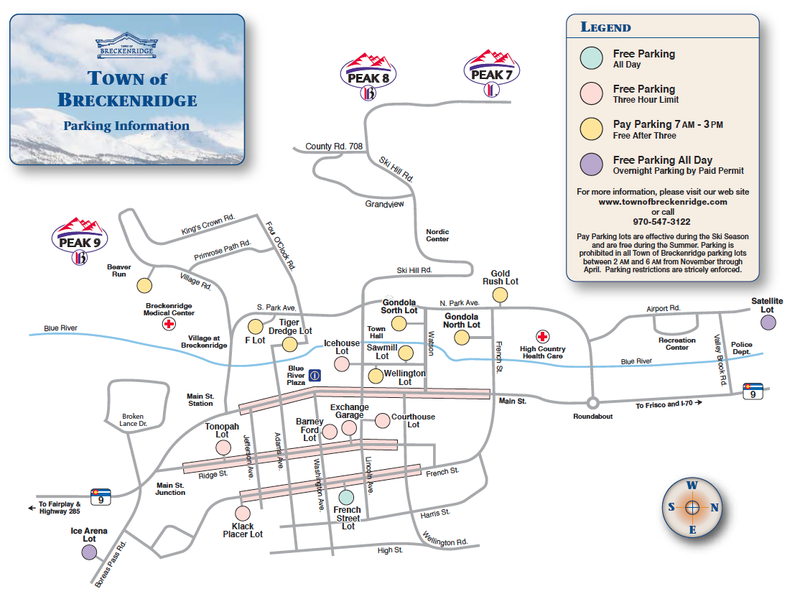 Here is a map and useful information guide for overnight parking and skier day parking. For details on parking rates and information click here.